Suave Professionals Refresh and Revive Dry Shampoo helps to keep your hair looking fresh and clean between washes. 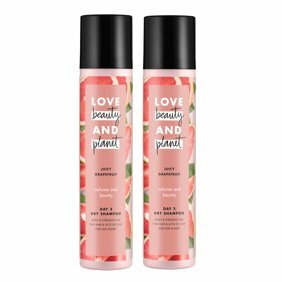 This dry shampoo spray contains mineral clay and absorbs oil from the scalp, to stop hair from looking and feeling greasy. Waterless shampoo formulas are the perfect option for when you're in a hurry or out and about. Suave Professionals Refresh and Revive Dry Shampoo is salon proven to refresh hair as well as the Rene Furterer dry shampoo. You can also try other Suave Professionals styling and finishing products, which include serums, gels, leave-in conditioners and hair sprays to help you achieve your desired look. Achieve Salon-Quality Results Suave Professionals is salon-proven to work as well as salon brands, helping you achieve a variety of beautiful hairstyles while caring for your hair. This line is developed to help you achieve naturally gorgeous, healthy-looking locks. About Suave For over 75 years Suave has offered professional quality products for the entire family, which are proven to work as well as salon brands. The Suave mission is to make gold standard quality attainable to all, so everyone can look good, smell good, and feel good every day (Rene Furterer is a registered trademark of Pierre Fabre Dermo-Cosmetique). Ingredients: Isobutane, Propane SD Alcohol 40-B (Alcohol Denat. ), Aluminum Starch Octenylsuccinate, Butane, Fragrance (Parfum), Isopropyl Myristate, Silica, Kaolin, Silk Amino Acids. Instructions: How to Use: Step 1: Shake can before & during use. Spray on lifted sections of dry hair, 8-12 inches from roots, where hair is most oily. Step 2: Massage through roots to absorb oil evenly. Step 3. Brush through for hair that is revived & full of body. Can't go without this stuff! I LOVE this product! I'm a busy mom and I use this between washing my hair. I can go 3 days between washes. I have longer hair that goes 4 inches past my shoulders. I think anyone that has given this product a bad review is using it incorrectly. I have been using it for 2+ years now and I love it! :) I do have red hair and it blends in great leaving no white cast. I have even used it when I colored my hair dark auburn and it worked just as perfect! I use for my mom in a nursing home. It is super for giving her super thin and fine hair a bit of body and looking fresh between shower days. And it SMELLS WONDERFUL. Strategically incline to give a optimistic approach within the product. I will need to mention that the idea is wonderful. Trying the shampoo item can improve my entire living situation. Always on the move or working. I can have a great experience while in a rush to my current activities. The product is an awesome invention. Thank you for thinking of me.